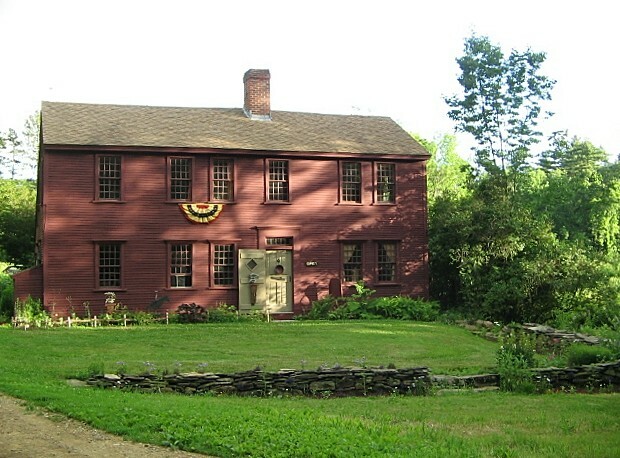 Walker Homestead is a 1698 colonial saltbox situated on 30 acres in central Massachusetts offering a little bit of the 18th century for all of our visitors. We are Kris & Paul Casucci and we work together to create a resource for you filled with antiques, primitives, reproduction furniture, clothing & handmade goods, sheep & wool, heirloom plants & gardens, herbs & dye plants. Walker Homestead is the home of Walker Homestead’s Antique & Primitive Goods Show which is held in June and September on our grounds, offering over 20 dealers of early American antiques and primitive goods, food, music and fun for all! An absolutely amazing time for everyone… you don’t want to miss it! Photos of the last show are up on our website and Facebook page to give you a taste of what it’s all about! We are involved in various off-site activities throughout the year, where we set up booths at shows and participate in events. View our calendar for our current schedule of events and appearances, we look forward to meeting you! Hello from the Pacific NW. I visit my family each summer in upstate NY (Saratoga) and would love to visit the Walker Homestead next summer. Where in central MA are you located – are you as far as Sturbridge? And by the way, what ever happened to Magpie Primitives in Canan – stopped by last summer and it was closed up tighter than a drum and I don’t think they are running their web site any longer. I thought that was a sweet shop and always enjoyed my visits. Look forward to hearing from you with Walker Homestead information. Thanks so much. We are 10 minutes from Sturbridge and Brimfield, we’d love to see you if you come out this way! We have a big country antiques show (Simple Treasures from the Past – Antiques & Primitive Goods Show) in June and September, if you happen out during that time (6/18 and 9/24 this year). As for Magpie, they are still around, but doing strictly shows and wholesale. They are also involved in a new wholesale show in PA the first weekend in February which we will be participating in at the Valley Forge Convention Center. They are on Facebook, too, which seems to be an easy way to contact them. So nice to hear from you, look forward to meeting you!